By now, half of you are either salivating over your keyboards or scratching your heads in bewilderment. It all comes down to your cooking style, I guess. I like to describe my style as simple. You won’t find extensive spices and foreign pastes lurking in my cupboards. If by some odd chance you do happen to come across one or two, I can almost guarantee you they’ve never been opened. I like to eat simple things, so in turn, my most treasured culinary brainchilds consist of pretty basic ingredients. I like sea salt and sweet paprika, good quality canola oil and, most of all, butter. There’s nothing quite like cooking with butter. The way it dances around your skillet with the slightest touch of heat, or how it morphs into this alluringly fragrant foam just seconds before melting into a rich and flavorful sauce. Now imagine lifting a thick, juicy strip of sirloin out of its paper wrapping, and ever so gently resting it in that oozing buttery melt. The satisfying sizzle as the flesh immediately starts to form an unforgettably irresistible crust, the savory aroma infusing your kitchen with the smells of home. That, for those of you who questioned the desirability of a class dedicated to “just” beef and butter, is why I was so sorely disappointed when the class was later cancelled. I won’t lie – I moped pretty hard at the thought of missing out on my chance to spend an entire Saturday browning beef in butter. But after a while, I decided to take matters into my own hands. Class or no class, I was going to sear. I’d been toying in my head the powerful combination of a good quality sirloin and the warm, rich notes of coffee for quite some time. When a recipe developer I work with pitched a steak dish with a coffee marinade a while ago, I stupidly questioned her judgement. Coffee and steak? Sounded like a grisly combo. And then I tried it. It’s hard to describe exactly how this works, but it’s like every ambrosial grind of coffee just soaks into the tender, grainy flesh of beef, accenting its earthy composure in a way that no spice or seasoning can. The coffee is subtle, yet it makes its presence well known to your greedy little taste buds with every melt-in-your-mouth bite. 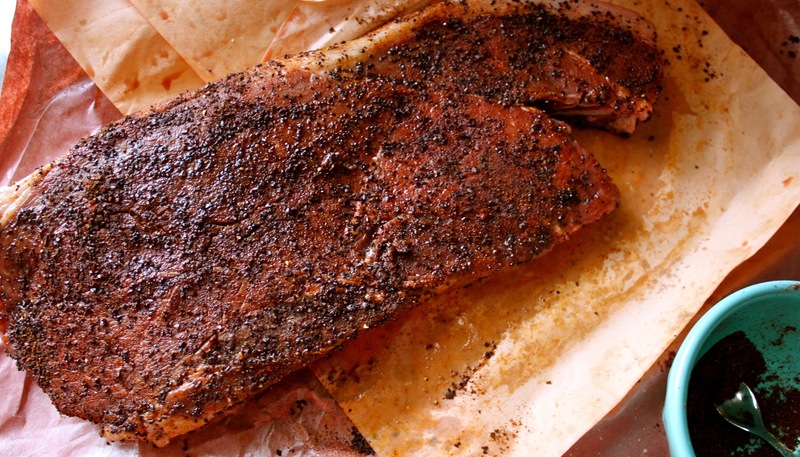 I really like the idea of a coffee rub. There’s something about the rough graininess of coffee that makes you want to slather it over a porous length of steak, working it into the flesh with your fingers. I wanted to add a nice mix of classic spices to balance the strength of the coffee, so I opted for a blend of sweet paprika, chile powder and a touch of cayenne for heat, and just a dash of cinnamon for warmth. You can always play around with the amounts according to your own taste, and try adding in some new spices for a twist. Sautéed bell peppers bring out the sweetness in this tender, juicy meat. I like to serve it with a fresh strawberry salad and some roasted baby potatoes. 2. In a small bowl, combine coffee, paprika, chile powder, salt, black pepper, cayenne and cinnamon. 3. Melt 2 tsp butter and rub all over steak. 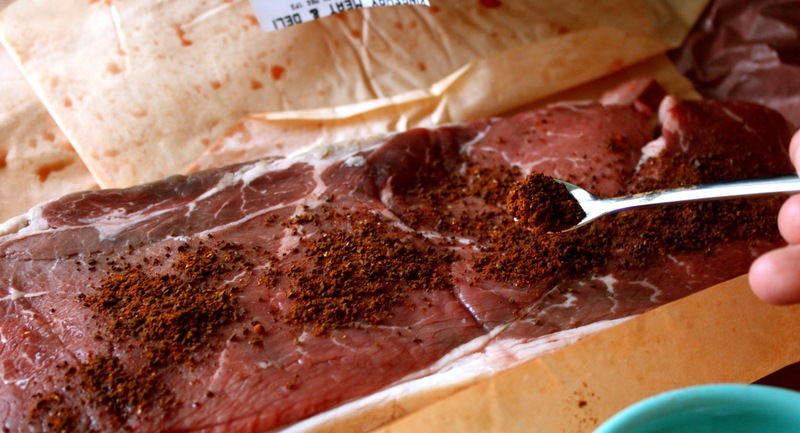 Rub spice mixture onto all sides of steak. 4. Heat a large grill pan or skillet on medium-high. Add butter and heat until melted. Add steak and sear, turning once, until a deep crust forms, 3 to 4 minutes per side. 5. Transfer steak to a foil-lined baking sheet and bake until steak is cooked to desired doneness, 15 to 20 minutes for medium-well. 6. Meanwhile, in a small nonstick skillet, heat oil on medium. Add bell peppers and sauté, stirring occasionally, until tender and skins are slightly blackened, 10 to 12 minutes. 7. Remove steak from oven. Let rest for 5 minutes. 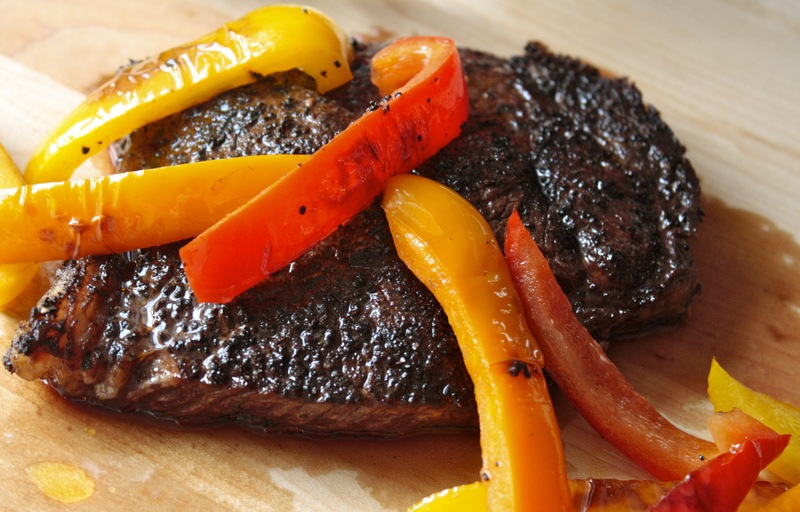 To serve, top steak with bell peppers. Hi Gilean! I don’t eat meat so I won’t be making this (unless the boyfriend gets lucky) but I wanted to stop in and say hi. I love when you put up new posts. Hope all is well! Thanks Molly! Great to hear from you 🙂 I just discovered your blog tonight – and I’m kind of obsessed. I love your writing! Let’s keep in touch.